Whether it’s a handcrafted bike or a print colored from harvested berries, each piece of art Dylan Miner makes has a story to tell. Both projects are rooted in the relationship between people and the environment. 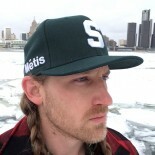 “Much of my work is socially engaged and deals with political and environmental issues in the Great Lakes and its indigenous communities,” said Miner, an activist, artist and MSU professor. Miner’s “The People, the Medicine” is a series of 27 relief prints of medicinal and edible plants found in the Great Lakes and surrounding areas. 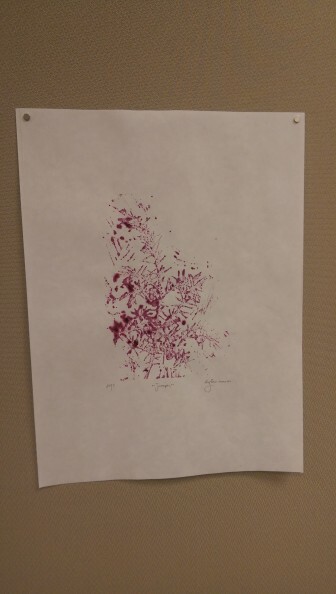 The ink for the prints is made from berries harvested by Native Americans. “I try to have conversations with natives who know how to use these traditional medicinal plants,” said Miner. This project, which started two years ago, is ongoing. Each print takes only around half a day to make, but interviews with native peoples and trying to understand the plant take the most time, Miner said. The second part of the exhibit brings together indigenous artists and college students to create low-rider bikes. Each bike is a visual representation of the fundamental values taught by the Anishinaabeg, a tribe whose members live in Michigan, Wisconsin, Minnesota and Ontario. The bikes are meant to create a community among native and non-native peoples while reintroducing sustainable transportation, Miner said. Miner has been holding workshops to build these bikes since 2010, with each bike taking from four days to four months to complete. 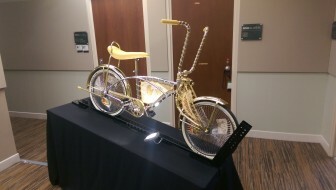 Although the bicycles are also a first for an MSU Global exhibit, it is Miner’s theme that sets him apart, said Christine Geith, executive director. Miner’s projects extend far beyond this exhibit, with two currently in the works. Miner has been a practicing artist for 15 years and doesn’t take his role as a socially engaged artist lightly. Miner said he hopes that his art will cause people to slow down and interact with the environment, focusing on issues at hand instead of living day to day. Miner’s exhibit is open Monday through Friday, and will be on display until Feb. 18. at the MSU Global Gallery.